FREE delivery on orders overs €199 + 23% VAT (or Sterling equivalent) to Ireland and UK (except UK Highlands and Islands see below). 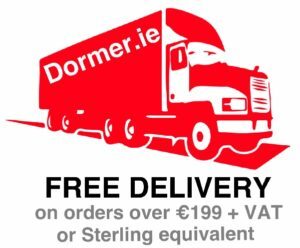 Select the free shipping option on checkout to avail of this offer. Delivery charge of €9.95 + 23% VAT (or Sterling equivalent) for all orders to Ireland and UK (except UK Highlands and Islands see below) that are below €199.00 + 23% VAT (or Sterling equivalent). We may charge extra for deliveries to the UK Highlands and Islands depending on the weight of the order. We will notify you after receiving your order. Please note we only deliver to Ireland and UK. We currently do not deliver to any other countries. Fast delivery of usually 1 to 5 working days for most products. In addition, we will advise on receipt of order if the lead time will be longer for whatever reason. Our courier will ask for a signature as proof of delivery. Once we receive a signed proof of delivery we accept no responsibility for the final destination of the order. In addition, after we receive a signed proof of delivery any queries on missing orders will need to be taken up with our courier. If for any reason our courier is unable get a signature as proof of delivery, or is requested by a customer to leave the order without a signature, we are unable to take responsibility for the order once the courier has recorded the item as delivered. Any queries will need to be taken up with our courier.